This week, I visited a home in Tijuana for young girls who have been trafficked -- bought and sold into slavery, sometimes across international borders, sometimes not, but always horrifically abused and tortured either psychologically, physically, or both -- and spoke with them, an adult trafficking victim, and Alma, who started the home. The issue of human trafficking is enormous and difficult to fully appreciate, so I will only focus on thing: a woman I met who I'll call Mari. Mari is 40 years old. She was born in Mexico, and spent the first few years of her life in Tijuana. She had always heard that the United States were where you could go to make money to take care of your family, so when a friend of her parents said he was going to the US, she asked him to take her along. What Mari didn't know was that he was a smuggler, a coyote. He took her to Encinitas, an upscale beach town in San Diego where there was a large but invisible population of undocumented immigrants, and left her in a shantytown, where she met her captor, who repeatedly raped her, abused her, incarcerated her, and impregnated her. Mari was 13, and he was in his 40s. She stayed with him until she was 19, living under constant threat, working as a maid or a fruit picker by day and being raped and beaten by night -- until he shot and killed a man they both knew. Mari took the blame, and ended up going to prison for the crime for 18 years before she was let out. 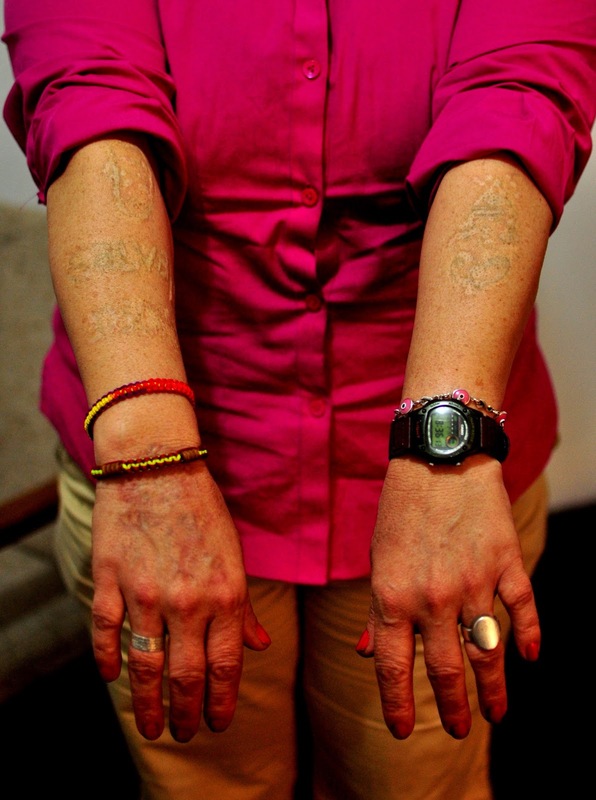 Afterward, she returned to Tijuana to look for her family and try to pull her life back together, but because she was an ex-convict covered in tattoos, tattoos that the man who had kept her in the shantytown had carved on her to mark her as "his," she was unable to get a job, and her family rejected her. They thought she was a gangster. Mari is in the process of getting her tattoos removed. Her family has little contact with her. She works a low-paying job in Tijuana and spends a lot of time at Casa del Jardin. All she wants, she says, is a family, and to be loved, and to be able to love without reservation. One of the things people ask her the most, she says, is why she stayed with her kidnapper for so long. This is one of the most insidious and deeply violent things about human trafficking: the implied or explicit threat. In Mari's case, her captor told her he would kill her family in Mexico if she tried to escape, backing it up with extreme physical, emotional, and sexual abuse, and eventually, like so many others, she stopped trying to leave and began trying to simply survive. Mari's story is harrowing and heartbreaking, but hardly unique. The brothels and streets of certain parts of Tijuana are filled with them. Theirs is a life circumscribed by market forces; they are the supply, and the demand, as Alma from Casa del Jardin points out, comes almost entirely across the border, from the United States. Everywhere, trafficked humans are the world's beasts of burden. White and even purple. Hair division: We must use all hair formalities to be able to divide hair into four parts or more determined by the density of hair and thickness, to facilitate the process of dyeing hair. Start by dyeing the hair: we remove the hair part, and put the dye on the hair using the brush special dye taking into account leaving a quarter of an inch or five centimeters from the roots and continue to the end of the hair follicle and start from the back forward by placing the dye in the same way. We leave the dye on for a quarter of an hour and then go back to the distance we left near the roots and dye it using the hair dye brush and dye it the same way from the back to the front. Leave the pigment: We leave the dye on the hair according to the recommended length on the coloring paper. We recommend that the hair be wrapped around a bag so that it does not cause dyeing or contaminating anywhere, and hair should be lost from time to time to ensure that the hair has the desired color. Washing hair: We wash the hair dye first with water alone to ensure the removal of hair dye, and then shampoo hair shampoo special nature of the quality of hair, and after washing shampoo, we use the bath oil or balsam as you have at home and leave it on the hair for at least five And then rinsed it with water. Dry hair: We must dry the hair first using the towel, and then use the floss to dry the hair or leave it exposed to the air to dry and then will show the color we obtained, we verify the authenticity of the result of the process of dye. الأبيض وحتى الأرجواني. تقسيم الشعر: فيجب أن نستخدم بكل الشكالات للشعر لنتمكن من تقسيم الشعر الى أربعة أجزاء أو أكثر نحدّدها حسب كثافة الشعر وسمكه، لتسهيل عملية صبغ الشعر. البدء بصبغ الشعر: نقوم بفكّ الشعرجزءاً جزءاً، ووضع الصبغة على الشعر بستخدام فرشاة الصبغة الخاصة مع مراعاة ترك مسافة ربع شبر أو خمسة سانتيمترات من الجذور ونكمل حتى نهاية خصلة الشعر ونبدأ من الخلف الى الأمام بوضع الصبغة بنفس الطريقة. نقوم بترك الصبغة مدة من الوقت ، فيفضل أن نترك الصبغة على الشعر لمدّة ربع ساعة ثم الرجوع الى المسافة التي تركناها بالقرب من الجذور ونقوم بصبغها باستخدام الفرشاة الخاصّة بصبغ الشعر ونصبغه بنفس الطريقة من الخلف للأمام. ترك الصبغة: نقوم بترك الصبغة على الشعر حسب المدة الموصى بها على ورقة الإرشادات الخاصة بالصبغة ، وننصح بلف الشعر حول كيس لكي لا يتسبب بصبغ أو تلويث أيّ مكان بالصبغة، ويجب تفقّد الشعر من حين لآخر لضمان أنّ الشعر حصل على اللون المطلوب. غسل الشعر: فنقوم بغسل الصبغة عن الشعر أولاً بالماء وحده حتىّ نضمن إزالة الصبغة عن الشعر، ثمّ نقوم بغشل الشعر بالشامبو الخاصّ لطبيعة نوعية الشعر، وبعد غسله بالشامبو نقوم باستخدام حمام الزيت أو البلسم حسب المتوفّر لديك في المنزل وتركه على الشعر لمدّة لا تقلّ عن خمس دقائق ثم نقوم بشطفه بالماء. تجفيف الشعر: يجب أن نقوم بتجفيف الشعر أولاً باستخدام المنشفة، ثمّ استخدام السشوار لتجفيف الشعر أو تركه يتعرّض للهواء حتّى يجفّ وعندها سيظهر اللّون الذي حصلنا عليه ، فنتحقق من صحّة النتيجة من عمليّة الصبغة. مجموعة لوريال فيريا هي صبغة الشعر للجنسين، توفر الألوان الحديثة مع الكثير من المواد الغذائية وعلاجات تكييف الشعر. هي صبغة فريدة من نوعها تسلط الضوء على الرجل الذي يظهر أنيقا وسيدا. يتميز بتشكيلة مميزة من الألوان للشعر التي تناسب الرجال والشباب، فهي مجموعة واسعة لتنتقي منها اللون الذي يتناسب مع شخصيتك. هي الأنسب ووسيلة ممتعة لإضافة الاندفاع والحماس. 123 HP Printer Help – Step by Step guide for Setup, Download & complete installation online. We are providing independent support service if in case you face a problem to downloading or Setup HP Drivers software.